What do our fly fishing guides do if they get a day off? Fish the Beaverhead, of course! Here is Troy with a nice brown caught and released this morning. 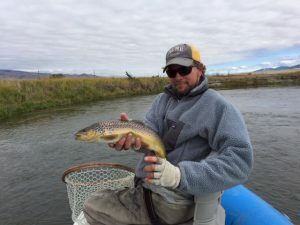 Troy is a team member of our Fish Like a Guide, But Live Like a Client – Fall Fly Fishing School, October 14-19 at Healing Waters Lodge. Call Mike Geary (406-459-2030) today for more details.